Mangaluru, Oct 10, 2017: Speaking to media after inaugurating the survey work at Mulki-Karnad Road to facilitate the four-laning work of Mulki - Kateel-Bajpe-Polali-BC Road on October 9, Monday.DK Lok Sabha member Nalin Kumar Kateel said Dakshina Kannada district will undergo an overall change in the next two years in terms of road transport. MP Kateel said that STUP company is conducting the survey. Based on the survey, a detailed project report will be prepared. The possibility of constructing medians and circles will also be considered, he added. 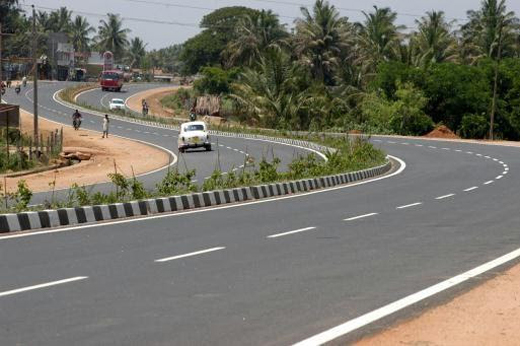 According to the works sanctioned by the Ministry of Road Transport and Highways under ‘Bharat Mala’ project (Highway to Highway connectivity), totally four routes will be converted to four-lane, he added. The MP recalled that he had submitted the proposals for the four laning of Mulki-Kateel-Bajpe-Polali-BC Road and Melkar-Mudipu-Konaje-Thokkottu to Union Road Transport and Highways Minister Nitin Gadkari, during his Mangaluru visit. The ministry has approved the proposals for the four-laning of the roads. They will be part of the ring road under the ‘Bharat Mala’ project. The four-laning of the roads will decrease the traffic density on Mangaluru Road. Once the road works are complete, those who travel from Udupi to Bengaluru can pass through Mulki-Melkar Road and connect to the BC Road to proceed towards Bengaluru, without passing through Mangaluru. Also, those from Kasargod, can go to Madikeri or Mysuru on Konaje-Melkar Road and join B C Road. The four-laning of a total of 91 km road under phase one has been handed over to the National Highway Authority of India (NHAI), he said. The MP said that the works of other three roads Gundya-Subrahmanya, Bantwal–Siddakatte-Moodbidri and Kalladka-Chervattur have been handed over to the Public Works Department. The funding will be done by the Union government, he added. “The land acquisition process towards the BC Road- Addahole Road work has been completed and the L&T company has started the work. The problems related to the Forest, Revenue Departments, Mescom and BSNL will be cleared soon and the work will be started by October end,” he noted. The MP said that there is a bad trend of deviating plans so as to prevent houses getting acquired for the road works. But the current works by the NHAI are done in accordance with the road alignment plan and there is no question of succumbing to any kind of pressure to divert the road, he clarified. “It is true that people are driven by emotions when their land and house are acquired for roads. But they should understand that it is in the interest of the country. According to the new regulations implemented by the Union government, the evacuees are entitled to get four times the estimated face value of the land as compensation,” he said. Zilla Panchayat vice-president Kasturi Panja, Town Panchayat president Sunil, BJP Moodbidri constituency president Ishwar Kateel, Bantwal constituency president Devdas Shetty, NHAI project engineer Ajith, highway design head H V Mallikarjuna and STUP design head T V Rajiv were present. kindly let me know where i would get the copy of approved road map? whom i have to approach for getting the payment of land acquisition? The four way roads are neatly tarred and adds to the beauty and development of the city .